It was three days after Christmas in 2005, and Dave Bronson, with a small crew of family and friends, was running south of Oregon Inlet in his 25-foot walkaround, looking for a good spot to wet the lines and start the day. Suddenly a "cyclone of birds" formed ahead. 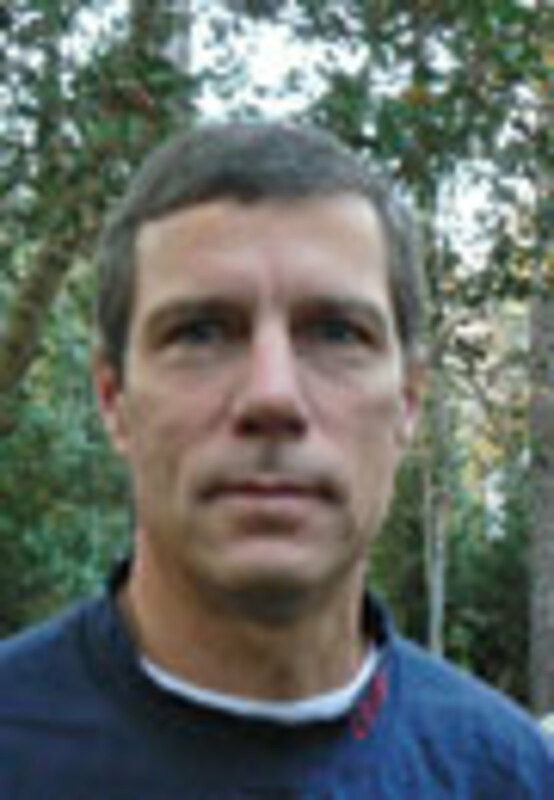 "I was the first on the scene and began working baits around a mass of feeding stripers," recalls the 49-year-old pharmaceutical research scientist from Apex, N.C. The first two fish landed were in the low-30-pound range. The third was what Bronson rightly calls the "catch of a lifetime" - a 62-pound striped bass that proved to be the largest caught in North Carolina history. It&apos;s still a record catch and it was featured in local and national publications. Bronson became a fishing celebrity. "While the catch itself is forever memory, what made it even more special is the fact that I had my son, Joshua, on board," Bronson says. And Bronson caught it on his own boat, one that had already served as the family fishing overnighter for more than a dozen years. The boat is a 1989 Mako 250 Walkaround Cuddy and the record striper may have been the biggest fish the boat has landed, but it certainly wasn&apos;t the first. 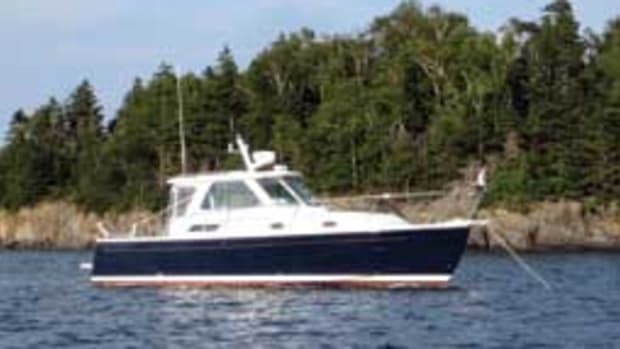 Bronson bought the deep-vee 25-footer from Greenville (N.C.) Marine in 1991 for about $36,000. During his 20 years of ownership, he has used Triple Crown mostly offshore, going after tuna and dolphin off North Carolina. And it has proved to be a keeper, says Bronson, who grew up fishing on Chesapeake Bay with his fighter-pilot father, who was stationed at Langley Air Force Base in Hampton, Va.
"The Mako is a solid running boat. It&apos;s dry under most conditions and really performs well running the troughs and in a following sea," he says. "The boat is a deep-vee design and it runs the open water very nicely while still providing a stable trolling platform." Triple Crown is equipped with Furuno electronics, including two GPS/chart plotters and a radar/depth sounder/fishfinder. Bronson converted the boat&apos;s lighting system to LEDs, including red overhead lights for running at night, cool-blue deck-level lights and white above-deck lights. Through the years, he has repowered twice. 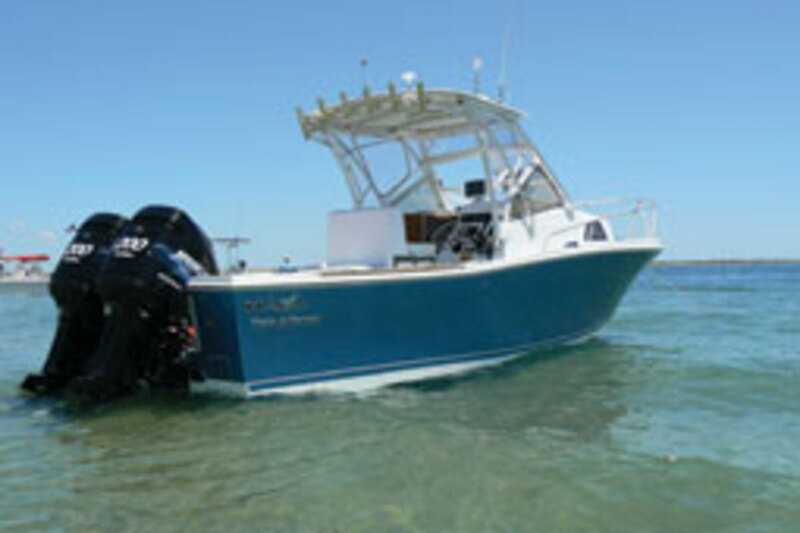 Current power is a pair of 200-hp Mercury Optimax outboards. These give the Mako a 50-mph top end and a range of about 325 miles. Average speed is 35 to 45 mph at 4,000 to 5,000 rpm, with fuel use averaging around 2 mpg. Bronson has just redone the boat inside and out from stem to stern. The project began with a fuel tank replacement and Bronson simply kept going, inspired by viewing similar projects posted on the Mako owners website, www.classicmako.com (founded by Bronson&apos;s friend Eddie Ring). 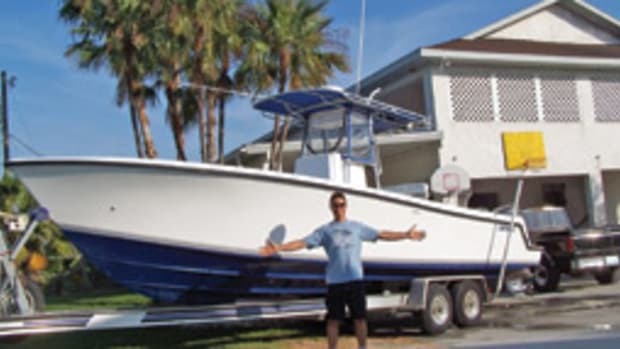 "When I started, I had no fiberglass, marine wiring or marine painting experience," he says. "As I gained more confidence in my skills, I decided to completely renovate the 20-year-old vessel." Here&apos;s some of what was done: deck lids and hatches recored, gelcoat cracks repaired, bilge cleaned and painted, new components installed and wiring redone. The windshield was removed, repaired and raised, and the helm was redesigned. New Mercury SmartCraft gauges were added, and new epoxy-coated cherry and mahogany console doors were installed. A custom hardtop was also installed. Below, new cherry paneling was added and the cabin windows were replaced with custom ports. "While I did the interior rebuild, it was obvious to me that in order to make this boat special I would have to take it to a pro to refinish the exterior of the hull," Bronson says. It was the final touch. Last February he trailered the boat to Raybo Marine in Lindenhurst, N.Y., on Long Island, "fighting snow and ice" in a storm. The ordeal was worth it. Three weeks later, Bronson picked up his boat. It was transformed, he says, the older cream-colored gelcoat replaced by an "eye-popping metallic blue." 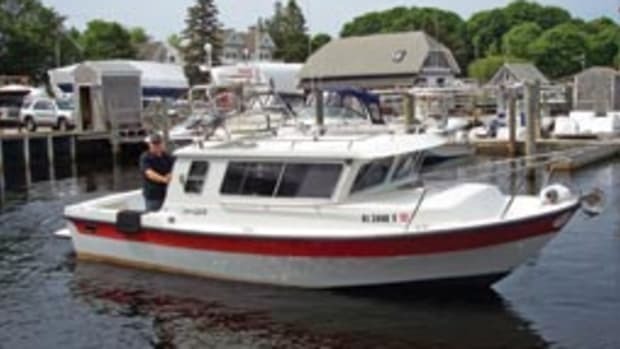 The family Mako earned its makeover, says Bronson, who enjoys the water with his wife, Sandy, and their three children. "The design offers versatility and the boat functions well as an offshore fishing vessel, as well as being very comfortable for camping, cooking and overnighting." It&apos;s a record-setter and a bit of a celebrity, too. 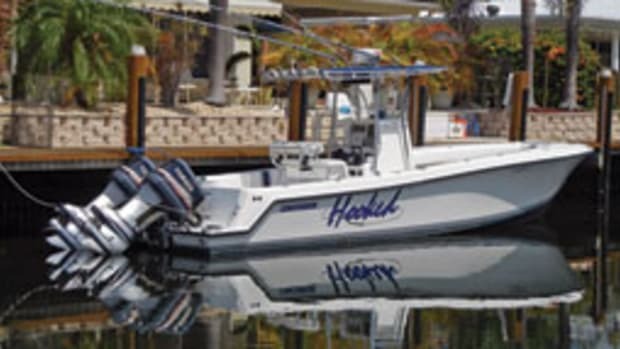 The 1989 Mako 250 Walkaround Cuddy rides a 23-degree deep-vee, hard-chine hull. 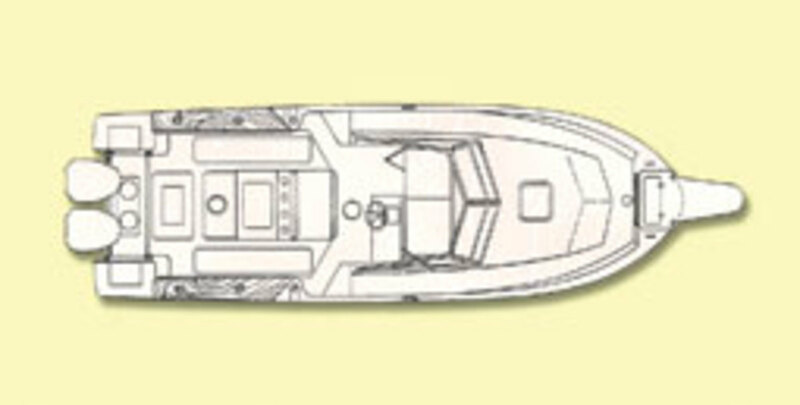 The small trunk cabin, with its overhead hatch, is surrounded by wide side decks that give good access for fishing and docking. The helm station is to starboard, protected by the aluminum-frame windscreen and with an electronics console, a dedicated helm chair and a companion seat. The cockpit is open and unobstructed, leaving plenty of room for fishing. Gunwale rod holders and under-gunwale storage are standard. The twin outboards are mounted in a well, closed off from the cockpit. Popular options and add-ons include a T-top or hardtop, an electronics box and outriggers. The cuddy is laid out with a standard V-berth and a portable head, and it provides a few creature comforts, as well as protected storage. 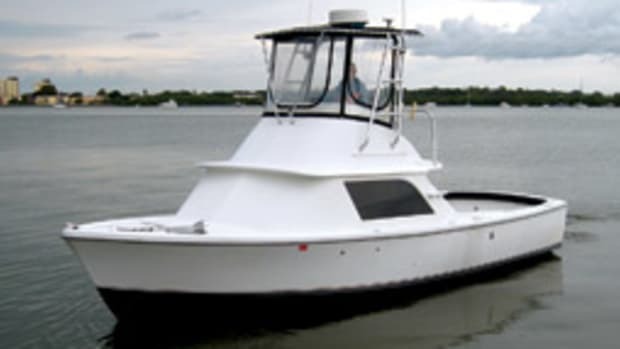 Mako Marine was founded in Florida in the late 1960s and quickly established itself as a premier builder of small, capable sportfishing boats. 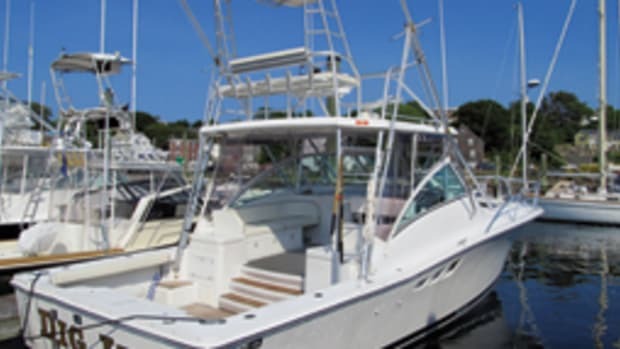 Its designs helped popularize the center console as a fishing machine, and the company fanned the enthusiasm for its fleet, which grew to include walk-arounds and express models, by sponsoring its own fishing tournaments. Despite its success, Mako Marine ceased operations in the early 1990s, but the nameplate was revived by mid-decade. 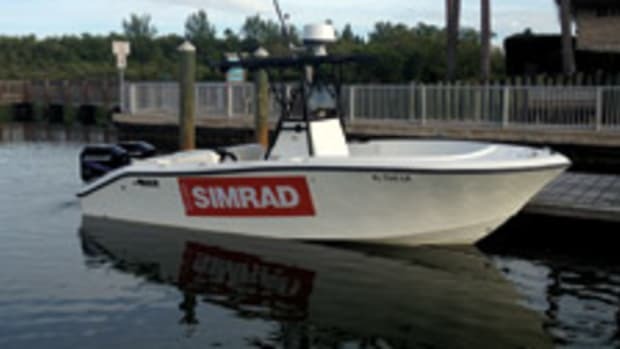 Today, it offers a fleet of inshore and offshore fishing boats in the 18- to 28-foot range as part of the Tracker Marine Group. Prices for used Mako 250s range from about $10,000 to $25,000. 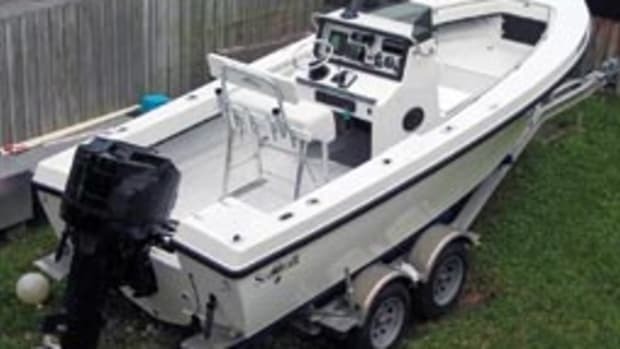 BUILDER: Mako Marine International Inc., Forest City, N.C.
Click here to find more Mako boats.